Sometime before February 25, I will have moved my entire life into a brand new apartment. But before I move, I have to paint. Yes. HAVE. Back when I was young, I did not find value in chosing the colors of my walls. My bedroom in my Mom's house was this pinkish-purple color with an unfortunate accent wall of stripped wallpaper. It was fine while I was growing up until my penchance for posters and other crap on my walls totally destroyed it. Now there are these giant sploches of exposed plaster everywhere. Luckily, its my baby-sister's problem now. Anyway, occasionally I would want to paint it, but my Mom always said that I didn't keep it clean enough. So I wasn't allowed. Touche, Mom. So in every apartment and living situation I've always just accepteded the colors and moved on. I've lived in rooms that were coral, orange, green, and various shades of dirty-white. This was fine until I moved in with the Boyfriend. In our first apartment (a year ago) - the master bedroom was this atrocious shade of mustard yellow. I still, to this day, cannot figure out why anyone who wasn't cracked out on European Interior Design magazines would think that was an acceptable color to paint ANYTHING. At this point we were still in the woo-ing stage in our relationship and I told Boyfriend that I would never live in a bedroom this color. 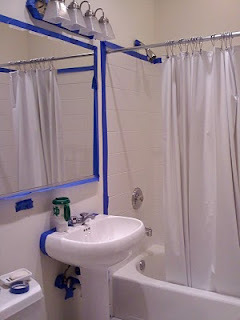 So we picked out paint and painted it (and the attached bathroom which was the SAME color. Horrifying.) - and it turned out really pretty. So now we're moving and in our new apartment there is only one room (techinically its a nook) that is painted an unfortuntate color. The bathroom and the bedroom are both white, not great, but not terrible. I figured since we are two very busy people with careers and theater engagements, we would just leave them the sad droopy white and go about our lives. Inc ase you haven't figured out by now - I was gravely mistaken. So we're painting. But of course, we don't have "days off" and we only gave ourselves 10 days to get everything done - so we're painting at night. I got home from seeing the Joffrey's Cinderella at 10:30 last night, only to spend the next three hours covering the bathroom with blue tape. Tonight I will spend a cool 6 or 7 hours (after work) painting the nook (which was orange, and so really needed the paint job), bathroom and bedroom. One can only hope we'll get it all done, but I am not holding my breath. This is, naturally, before any actual moving happens. Last night around 12:30 the Boyfriend (who, bless his little go-getter heart had been working since 6 or 7 PM) turned to me and said, "are there people we can to do this for us, like Power Movers but with paint?" "When are we going to figure out that its worth our time to pay people to do this for us."